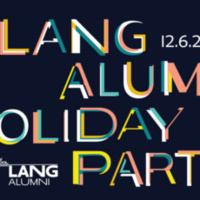 Join your vibrant Lang community at the annual Lang Alumni Holiday Party! Connect with alumni, faculty, and Eugene Lang College Dean Stephanie Browner, as we celebrate the many eras of Lang. Close out 2018 with a vintage throwback-themed event complete with a live DJ set, seasonal cocktails, and vintage Lang swag. Presented by The New School's Eugene Lang College.